When I clicked on your picture of 1812 I was staggered! I last saw her a couple of years ago languishing at the back of their shed in a dreadful state. Panels were off, no work, other than dismantling, appeared to have been done and my feeling that the BTS would have done better to leave her in Santander condition was strongly reinforced! They've obviously pulled out all the stops to reach the stage she's at now! I might be a little 'out' with my estimate of two years since I saw her, but not much! Anyway, I'm delighted to see it - especially as twenty years has passed since any progress was made. I'd fully expected that 1812 would forever remain simply 'retained' rather than 'restored'! I am in complete agreement with you on the matter of photographs - I've had a fine time examining every corner of your scenes; fashions, cars, shop fronts, street 'furniture' - it's all fascinating because this was the world the vehicles were a part of, and our memories should always include these peripheral, but vital, elements. Further pictures, taken on 30 July 2000 by your Webmaster, of the interior of London trolleybus #1812 are shown below. It was noted that an appeal for funds of approximately £25,000 were being made to complete the restoration of this vehicle. Lower saloon looking towards rear. Lower saloon from the boarding platform. Looking into the rather dejected cab. Upper deck almost ready for passengers! I'm sure you will be interested to learn that Sandtoft Transport Centre intends to re-launch London Q1 1812 back into service this year. The date has been set as 28th May 2001 [Spring Bank Holiday] even though there is still a lot to do! The work to restore her from wrong-hand operation in Spain has been going on for the last few years and we are obviously very excited at the prospect of her running again. 1812 is a 1948 B.U.T. 9641T with Metro-Cammell-Weymann Motor Buses H70R body. This vehicle was withdrawn in April 1961 and sold immediately to the operator Santander in Spain where she was modified by having the platform entrance re-built to the right-hand side, a centre exit was installed on the same side and the staircase was re-built to the left-hand side. She operated in that form until being withdrawn, for the second time in her life, in 1977. She was to spend the next two years in Spain before returning to Britain in 1979. Bob Price remembers a team travelling to Santander, buying 1812, towing it to Bilabao and then dragging it from Southampton to Reading. 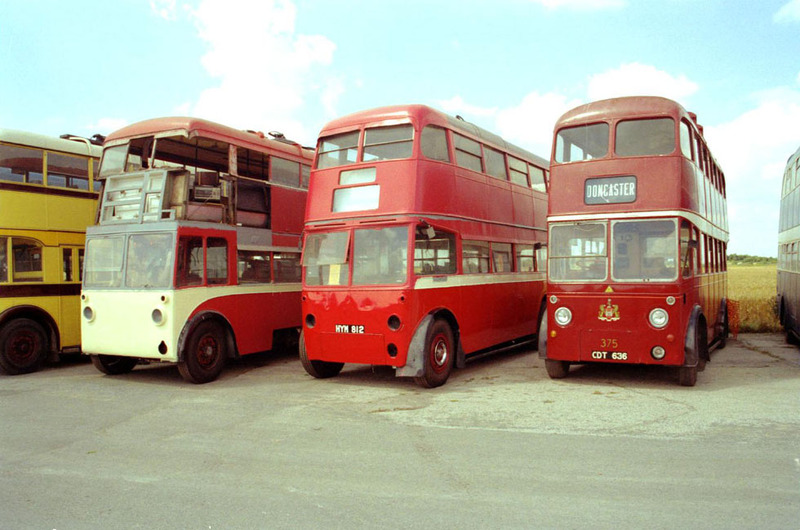 It was in the Chiltern Queens Garage for a while and was displayed at Uxbridge Showbus one year. Now located at the Sandtoft Transport Centre, Doncaster, restoration continues apace, with the construction of the staircase now well in hand, new brown leather cloth applied to the interior, seats acquired and ready to be re-upholstered [kindly donated by the London Trolleybus Preservation Society at Carlton Colville] and numerous other jobs including replacing rotten floor boards and rebuilding the front destination box. Attention is now turning to the underneath. Viewing the vehicle in 2000, there is perhaps to be some two to five years effort in restoration before its next powered run. I recall reading about the return of 1812 to these shores after several 'pleasant' years operating in the Spanish sunshine. I well re-call spending a holiday in San Sebastian back in 1962 with my parents [I was just 19 at that time] and furthermore taking a couple of trips on them just for the fun of it. Working for London Transport I had my bus/tube pass with me, and caused some fun when offering it to the conductor who sat at a booth in the stairwell. All the interior was still very much L.T, but of course the entrance had been changed to reflect driving on the 'wrong' side of the road. I took several photographs of these vehicles in service which may be of interest, though I doubt whether 1812 featured amongst them. The 'Blue and White' paint job covered over the familiar London bus red, but you could still see the 'London Transport' name and fleet numbers [which I noted down] quite clearly underneath it. I travelled on the 'last' trolleybus into Fulwell depot, and secured a short length of bunting which I still have, I also obtained an interior stairwell mirror which is available complete with bracket. Finally I also have an Evening News bill-board announcing "London's Last Trolleybus". As I am having to clear out many of my 'souvenirs' from those halcyon days, I am keen to find a good home for these trolleybus bits to anyone who would be interested.